[Gerben] started on his adventure into the world of electronics about a year ago. His first big project is this magnificent word clock. It’s Dutch, if you’re wondering. As a web developer, the first thing [Gerben] did was build a web-based mockup of this clock. After that, he went crazy with power tools crafting the wooden frame. Perhaps too crazy, as he forgot the space for the electronics. This oversight was solved by making his own PCBs, first using peroxide and vinegar, then giving up and moving to peroxide and HCl. The easter egg for this word clock is a scrolling URL when the time is 13:37. A clever egg that is really completely original. 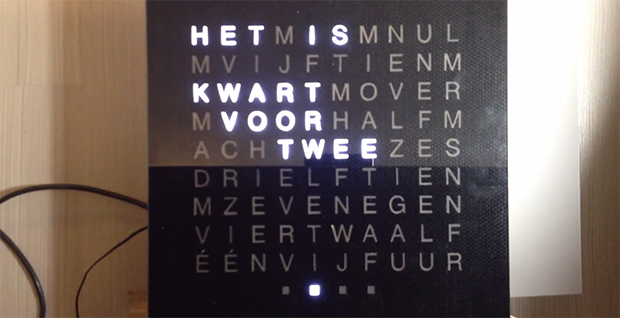 From the looks of the video, the fit and finish of this word clock is beyond anything we’ve seen before. The entire front of the clock is glass, with capacitive touch buttons down by the four-LED ‘minute’ display. Video below, Pics over here, and all the code and board files are here. I’m not sure why, but I find it delightful to use the letters as pixels in a larger display. Now I want to build my own that scrolls a summary when I get new phone notifications. Why does it look like he can get this to operate in English by changing the the LED sequence (in a cross-wordish fashion)? You’re noticing the similarities between Dutch and English, and missing the things like the lack of Qs.